Lead and Copper samples must be collected and submitted to the Division according to your system’s monitoring schedule and Sample Site Plan. Failure to submit samples will result in a violation and 50 IPS points added to the systems IPS total. There are two types of monitoring schedules for lead and copper testing. 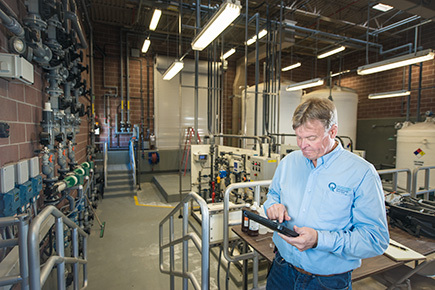 Your system’s LCR monitoring schedule can be viewed at waterlink.utah.gov. Samples are taken every six months. After two rounds of standard monitoring a system may qualify for a reduced monitoring schedule. Samples are taken either yearly or every three years. Systems may be returned to a standard monitoring schedule due to failure to sample or incorrect follow up on sampling results. When should you collect Lead and Copper Samples? Samples must be collected and submitted to the Division during the sampling window to be considered from compliance. In order for lead and copper result to be used for compliance an approved laboratory must be used. Most labs will submit results to the Division for you. This is the preferred method. Just select this option on the lab’s chain of custody form. There is no need to email, fax, or mail your results to the Division when this option is used. Simply retain a copy of the results for your own records. Results may also be submitted to ddwreports@utah.gov.